We’ve all been to those corporate parties with a few plates of food, a bar, and absolutely no event entertainment. 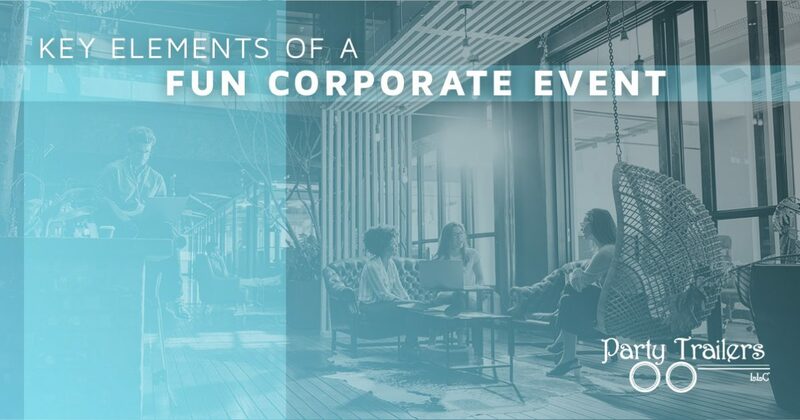 While it can be fun to mingle with your coworkers outside of the work environment, a truly memorable corporate event needs to involve more elements than food and drinks. Luckily, in today’s post, we will discuss a few key elements that you will need if you want to make your next work party something that all of your employees and coworkers will remember for years. One element that you need if you want to make your party a hit is some form of entertainment. Unfortunately, some of the most popular and extravagant forms of entertainment can be a little expensive. Instead of settling for the next best thing, why not hire Party Trailers? Party Trailers is everything you need for your event in one convenient trailer! If you’re looking for karaoke, lawn games, and even a virtual reality headset, we’ve got it all! We are proud to be your go-to event entertainment for Nebraska, Kansas, Iowa, and Missouri, so if you’re hosting a corporate event in the near future, be sure to contact Party Trailers today! It’s easy to come up with a variety of ideas that all of your coworkers and employees will love, but it’s important that you have the budget to afford everything that you want. Unfortunately, the venue, food, entertainment, and decorations will all cost money, so before you start planning, it’s best to figure out how much money you have in your budget. Plan out which elements will cost the most money and go from there. Once you have a solid budget set aside for your party, then you can begin the fun part. One of the first things that you need to plan for your next corporate event is the venue. Having the party at your office may seem like the easiest thing to do, it may not be the most exciting choice. If you have the party at your office, it may be more difficult for your coworkers and employees to enjoy themselves and relax — after all, the office is where you go to work. Try thinking outside the box and finding a place that has beautiful views, open spaces for games, or even a place that has a special meaning to your town. You don’t necessarily need to host your event at a fancy hotel, even a park for a corporate BBQ is better than another party at the office. You may be thinking that setting a theme is only something that you do for a kid’s birthday party, but you might be surprised to learn that adults enjoy a themed party just as much as kids do. We’re not suggesting that you make everyone show up in costume, but if your venue, decorations, entertainment, and food all follow a theme, it will make the event more enjoyable for all that attend. If you plan on serving some sort of alcoholic beverages at your party, it’s the responsible thing to do to serve food as well. When it comes to the food that you serve at your corporate event, you want to ensure that you have things that everyone can eat. The food doesn’t necessarily have to be fancy, especially if you’re hosting an event that takes place outside. Try to think of foods that everyone will enjoy, such as veggies, chips, mini hamburgers, or even build-your-own macaroni and cheese! No party is complete without entertainment. Your theme, decorations, food, and venue may be amazing, but there needs to be some sort of entertainment in order to keep everyone engaged. When planning your event, you should decide whether the entertainment will be simply visual or whether it will be something interactive that your employees can participate in. For example, as visual entertainment, you can have videos playing that you have created throughout the year. If you want something interactive, you could create some fun games or have a photo booth! These are just a few key elements that you will need if you want to make your next corporate event something memorable. Need event entertainment for your party? Look no further than Party Trailers! Our trailers are full of everything you need to make your party exciting, including karaoke, dual gaming systems, lawn games, and more! Check our availability for your next event and contact Party Trailers to get started today!